This book, my Gentle Readers, is a fantastic journey of one man’s quest to overcome his birthright and find redemption. Molly weaves classic Christian And Egyptian figures into a tale stretching from thousands of years BC, to present day. Lucifer’s top general in Hell, Azazeal, has a desire to possess the fallen first female, Lilith. He proposes a bet, a winner take all battle between a single offspring from each of them. With Lucifer’s blessing they begin. What follows is a spiritual journey that challenges the concept of “nurture vs. nature”, begging the question “Can one overcome their birthright?” Malachi bin Sinai, son of Azazeal, would like to know. His path weaves from ancient Egypt, past the crucifixion, a stint as a Roman gladiator, to end in a brutal battle with his nemesis, Ra. I couldn’t put this one down and I doubt you will be able to either. This week’s featured author is Briana Michaels, author of the Paranormal Romance series, “Sins of the Sidhe”. Per our usual routine here, we will put her responses in GREEN while I will be BLUE. Briana, thank you for stopping by to visit with us today. Paranormal Romance isn’t necessarily something I read often, but it looks to be a thriving genre. Let’s begin with what brought you to the literary world? I read a lot as a child, but when I went to college there was no time for reading something that wasn’t on a syllabus, so I sort of gave up on books for fun. Then, when Harry Potter came out, I gave it a try and couldn’t put it down. It sparked a new reading frenzy in me and I read anything and everything after that. So thanks, J.K. Rowling, for bringing back my passion for reading. I think we all can thank her for bringing in a whole generation of readers. I know my kid loves the books. So we have fantasy covered, but what genre really excites you? It’s a toss between Paranormal Romance and Historical Romance. I love the darkness that is captured in paranormal reads. Give me danger, big fangs, big swords, and big… well… *ahem* you know, plots and stuff. It’s my true escape from reality. I love historicals because when it’s done right, you can almost believe it really happened that way. Yes, Jamie Fraser is real. Right? RIGHT? No matter what I read, it’s all about the romance for me. I can read about falling down the rabbit hole, casting a spell, meeting Benedict Arnold, or having dinner with Sir William Wallace, but there better be some steaminess in there somewhere. Romance is certainly not dead for you then. So from reading everything you could get your hands on, you went to writing your own. What prompted that shift? There must have been a story brewing in me for quite a while although I had no intentions of ever becoming a writer. I love to be in everyone else’s worlds, and that was always good enough for me. At the time I was a mom, a preschool art teacher, and a wife. That kept me running all day and night. I’d gone from having a dream job and owning my own business, to being a wife and mother who stayed home (also a dream job), to getting out and teaching art classes with a friend of mine, which was a ton of fun… but something was missing for me. I didn’t know what it was, but something was out of whack. One night, on my way home from having dinner with my husband, I looked at him and said, “I’m going to write a book. I have so much in me that needs to get out.” I sat down the next morning in front of my laptop and started typing. Two weeks later, my first novel was complete. And now writing has become my new dream job. Two weeks huh? That is an impressive turnaround. I think I know what genre you settled into, but let’s hear you talk about it. I’m all about the Paranormal Romance. I can’t imagine writing anything else. I love the dark side, it’s home to me. Throw in some danger, steamy scenes, and a kilt, and I’m a very happy woman. A kilt huh? Well, so two weeks to write the first book, but how did it go from your laptop to the shelves of Amazon? I’m self-published. As an Indie, it’s hard to get your name out there, to get people to notice you. You just sort of sprouted from the ground and you’re not in the sunshine yet like the big guys. But that’s okay. It all takes time: writing, editing, marketing, overall success. Writing my first book was the easy part. Hitting that publish button was terrifying. Getting that first bad review was nauseating. But then it just sort of smooths out. You get into a groove. Your skin gets a little thicker. You start to learn the dos and don’ts. You finally come to a point where you know what your goals are – and they are all within reach. The more I write, the hotter I burn. The hotter I burn, the more ideas I have. As ideas grow, so does your talent. It’s a beautiful thing, really – the evolution of a writer. By the way, this was a totally friendly, wonderful phone call. I didn’t take offense to what she was saying. She hadn’t meant it as an insult, I think I’d just surprised her. I knew jumping into a huge series might be a risky adventure and I didn’t care. I wanted it. Wanted it bad, baby. Very little in this world scares me more than regret. I knew I wanted to write a series and that’s just what I did. I went with my gut and couldn’t be happier with my decision. The conversation with that lovely agent sealed my fate in so many ways and I am eternally grateful for that phone call. She was awesome, helpful, and memorable. Lesson learned: You do you. Definitely sound advice for anyone considering putting pen to paper, or fingers to keys. So outside of writing steamy novels, what else drives your life? Writing is an obsession. It’s hard to walk away from it, even to take a shower. However, when life calls, I have to answer, which means prying my boney fingers off the keyboard and joining civilization. My husband and I love to garden, make a lot of things (like soap, wine, art), and we live on the side of a mountain that requires attention and hard work. If I’m not blissfully banging away on the keyboard, then I’m baking cakes, entertaining friends, chopping wood, plucking weeds, feeding chickens, canning food, sipping wine, catching crayfish, running kids to sports and dance, or doing laundry. Not necessarily in that order. Busy woman. I hope you don’t leave your readers too long on that fifth book. Now, you have a funny story to share, so let’s hear it. Her: “Oh, you’re the writer?” Disappointment was evident. Who knows what she was hoping for. Thank you again for stopping by Briana and I wish you success with all those books in your series. Maybe I will have to step outside my genre and pick up that first one myself. If anyone wants to find out more about Briana or keep tabs on her work, You can find her at the links below. Gentle Readers, I know it has been some time since my last review. I have been terribly busy and I apologize for that. Let’s dive into this one shall we? This story has love, betrayal, murder, supernatural curses, and eventually, a seeking of redemption. The beginning is great in that it gives us some background on the Banshee and why she is doing the haunting she is. I feel this was rushed quite a bit. Her becoming a banshee could almost have been a novel (or at least a novella) all on its own. Fast forward many generations and finally the bloodline is linked strongly enough to its Irish roots in order for her to come back with enough power to enact revenge again. This begins a race against time before the Banshee takes her next victim. Again, to me this was rushed a bit. There is also some tension, and one not so mild sexual scene, that seemed gratuitous and forced. Perhaps there was more to this storyline that made the scene/tension less “WOW, Here I am”. If so, I think it was lost to the editing floor. Overall I thought it an enjoyable read and I look forward to seeing what the author does with their next work. This week’s featured author is MJL Evans. As usual we will have my comments/questions in BLUE with MJL in GREEN. Thank you for stopping by MJL. Let’s jump right in and talk about your first forays into the literary world. I was read to growing up and I listened to audiobooks, so I believe this encouraged to be an avid reader from a young age. What genre excites you the most? Any other favorites? I really enjoy horror, fantasy, literary fiction, and erotica, Basically if it sounds interesting to me, I’ll read it. Sounds pretty eclectic. What made you decide to start writing your own stories? I’ve been writing stories from a very young age, they were my favourite homework assignments. I was inspired by what I read. Books like Alice in Wonderland, Charlie in the Chocolate Factory, and Little Women, they all fed my imagination. Wonderful choices. Do you consider yourself a writer of a specific genre, or do you dabble in several? Not really, I like dabbling. I mix genres in my stories. For example, No Quarter: Dominium is a mixture of historical fiction, romance, adventure, suspense and humour. LIfe isn’t just one genre, so my stories develop into whatever seems most natural. Characters do tend to take on a life of their own sometimes. How did your publishing journey play out? I became an Indie Author starting in 2013. At the time I hadn’t written in many years, it was always something I wanted to revisit. What pushed me back into writing was a routine surgery that went wrong and I almost bled to death (sounds melodramatic, I know!). But what it did was made me reevaluate what was important to me and I’ve been writing like hell ever since! Well, that is exciting. I’m glad you recovered to bring your stories to life. Do you have any other interests you’d like to share? I am also a visual artist who dabbles in acrylics, oils and watercolours. Also, I read a lot and cater to my two senior cats, who spend a lot of their time trying to push their way onto my keyboard! Cats and keyboards, a pretty common foil to getting any writing done. Now you’re situation is a bit different than my previous featured authors, as you have a partner. Can you tell us about that? I like writing my own stories, however, I’ve found that having a co-author is a great way to challenge my story ideas. We don’t always agree and sometimes I want to throw a thesaurus at his head, but it keeps the story-line fresh and ultimately makes the story better. Great perspective MJL. I’m glad you stopped by and chatted with us today. If anyone would like to find more information, or buy one of MJL’s books, you can find her at all the links below. And for any authors looking to be our featured author of the week, you can get details and sign up HERE. This week, my Gentle Readers, we have Chloe Hammond, author “Darkly Dreaming: Vicious and Quirky Vampire Literature for Grown-Ups (The Darkly Vampire Trilogy Book 1)” As usual we will put my questions/comments in BLUE and Chloe will be GREEN. First off, Thank you for stopping by Chloe. I always like to hear what brought an author into the literary world. Is there a specific person that turned you onto reading? I grew up without a T.V, so books were my best for of entertainment. Despite having a T.V now, reading is still my favourite pastime. Ok, I admit it, I’m addicted! As far as addictions go, reading is a pretty safe one I guess. What genre or genres are you addicted to? I love literary fiction, and I read it from all eras and countries. Literary fiction huh? What made you cross the line from reader to writer? I always planned to write- life just got in the way. Then I found myself losing my joie de vivre, and I was diagnosed with anxiety and depression. I needed to completely change my life, and I needed to be open about my diagnosis. Usually very self-sufficient, I refused to give the depression the isolation it craves. I feared judgement, but instead discovered gentle compassion and support. I finally made time to write again. Writing soothes and grounds me; exhilarates and stimulates me. Writing can be very cathartic. I am glad that you found your center through writing. So tell us about your published works. I’ve only published the one book so far, and I’m busily beavering away at book 2 of that trilogy, but even just with the one book I’ve managed to straddle several genres. 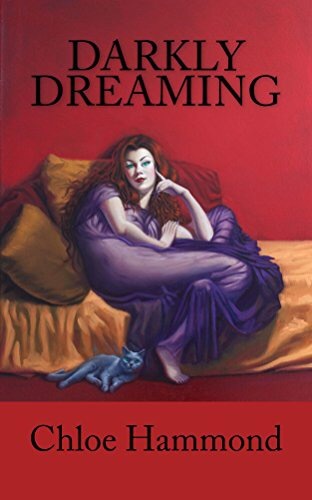 Darkly Dreaming seems to appeal most to readers who don’t usually read vampire novels and I’ve taken to describing it as vampire literature, as dark fantasy doesn’t begin to sum up the depth of exploration into my characters. Finding your niche is definitely a good goal. How did you go from finding your center to published author? A couple of years ago I started developing quite acute anxiety symptoms, and part of that was experiencing some vicious nightmares and I also suffered insomnia. Now, I could either crumble, and let them take over my life, or I could take the incredibly vivid scenes I was dreaming, and all the extra time I gained from the insomnia, and write the book I’ve wanted to write since I was seven. Which is what I did. I soon realised that the dreams could fit together into a story I cared about. And as I hit my stride the story took over, and the writing soothed the anxiety. Dreams often give us some of our best stories. When you aren’t writing, what do you like to do? I have just felt well enough to get back to working full time with homeless teenagers again after a year and a half of only an occasional shift while working full time at a wholesalers. I am also a wife, dog bed, and cat slave which also consumes a lot of my time, although I can combine those roles with my passion for a good T.V series like Game Of Thrones, Walking Dead, and Mr Robot. Sounds like you have a full schedule. Did you have anything else you would like to share with my readers? I just want readers to understand how important reviews are for authors. As well as the assistance they offer to encourage other readers to take a risk on an unknown writer, and the way every 25 reviews prompts Amazon to increase their promotions of the writer, reviews offer another vital role. I know I am not alone as a writer in having ‘dark nights of the soul’ when we completely doubt our own abilities. When these fears haunt me, what I do is scroll back through my reviews, to reassure myself that people have enjoyed what I’ve done. You may have written your review a year or more ago, and you may only have given a star rating and a sentence or so about how the book made you feel, or what you liked best. I promise you, if you’ve reviewed my book I have read that review a lot more than once. So thank you. Wonderful sentiments. I agree that reviews are critical. Thank you again for stopping by. For all of you looking to find more information on Chloe, here is a list of websites where you can find her and her book. If you are an author and want to be featured on Meet The Author Monday, you can find more information by Clicking Here.